October 8, 2010 - The Evergreen International Airlines (EIA) crewmembers, represented by the Air Line Pilots Association, Int’l (ALPA), remain frustrated as their management team continues to avoid their concerns and make empty promises. The crewmembers reinforced their lack of confidence in the airline’s upper management and flight operations management with a resolution passed by the pilot group’s Master Executive Council (MEC) to back their claim. The crewmembers are exhausted with management’s behavior of constantly violating their contract, not addressing the pilot shortage that affects the quality of life for current crewmembers, and the attitude that the crew force has had it too good for too long. Their continued disappointment comes after the crewmembers rejected a tentative collective bargaining agreement with management in August. “The crewmembers are fed up with empty promises from management as it continues to claim willingness to work with the union’s negotiators at the negotiating table, but has not done so over the past five years, and their multiple declarations of bringing more aircraft on to the property to no avail,” said William Fink, MEC chairman of the Evergreen pilot group. “We want to work with management for a fair contract and welcome an expedited resolution to restart contract negotiations without the close-minded attitude, as well as expand the airline with new aircraft, but its lack of commitment and follow-through makes us question the management team’s lip service." The parties remain under the jurisdiction of the National Mediation Board (NMB), which will determine future measures for processing this case. The union is preparing for the next steps in securing a fair and equitable contract for the EIA crewmembers and looks forward to the opportunity to continue where negotiations with management left off at the table. 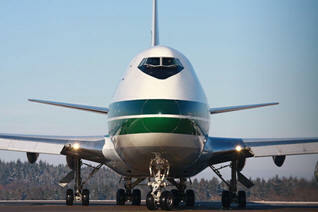 Evergreen International Airlines is a cargo airline based in McMinnville, Oregon, USA. It operates contract freight services, offering charters and scheduled flights, as well as wet lease services. It operates services for the U.S. military and the United States Postal Service, as well as ad hoc charter flights. Its main bases are Rickenbacker International Airport, Columbus, Ohio, John F. Kennedy International Airport, New York and Columbus Metropolitan Airport, with a hub at Hong Kong International Airport. Evergreen maintains a large aircraft maintenance and storage facility at the Pinal Air Park in Marana, Arizona that the company acquired from the CIA's Air America fleet.